The live entertainment industry encompasses a wide variety of activities and is composed of (i) event promoters, (or spectacle promoters); (ii) food, beverage, merchandise sellers, parking and venue operators; and (iii) sponsorship venues. There is a large variety in the demographic composition and preferences of a given audience in accordance with the type of event. The entertainment industry promotes a wide variety of events, mainly live music, theater performances, cultural exhibits and sporting events. Corporate sponsorships sales: this includes the promotion of corporate sponsors’ brands at one or more links in the live entertainment sector value chain. Many companies promote their brands at musical, sporting and cultural events and, more recently, at events promoting social or environmental responsibility. Sponsorships are central to the economic feasibility of an event, and sometimes the decision on whether to promote an event is influenced by the opportunity to work with a given sponsor. Sponsorship revenue may be performing in different stages of the live entertainment value chain, including: food, beverage and merchandise sales, venue operation, and parking. Worldwide entertainment business is an expressive market and has been increasing at high rates. According to Euromonitor, for 71 chosen countries per capita global represented nearly U$1.001 on an annual basis. Considering these countries’ population of 5.7 billion inhabitants, the total spending results US$5.7 trillion in 2012. Whether considered only the cultural and entertainment expenses totals US$ 2.0 trillion. The South American live entertainment market has been expanding faster than the overall global average. In Brazil, per capita spending on entertainment increased 13.0%, from US$152 in 2005 to US$359 in 2012, representing nearly US$70 billion in total spending. In this same period, Argentina saw an 8.0% increase to US$326, while Chile experienced a 12.0% increase to US$560 in per capita spending on entertainment. The South American live entertainment market differs from markets in more developed countries. 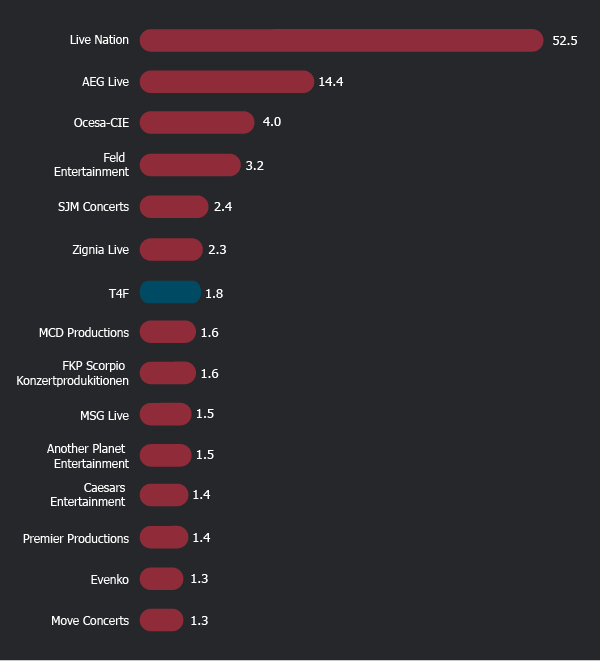 In more mature markets, larger companies like Live Nation, AEG Live and Disney typically have sufficient resources to manage both content and event promotion. In emerging markets, both local and international content providers generally do not have the operational scale or physical presence to promote their own content. Therefore, content providers seek to develop relationships and partnerships with local event promoters that have a proven track record and the financial resources to produce quality events on an economically feasible scale. These relationships and partnerships give a content provider access to markets with high potential returns, and in exchange, the local event promoter receives access to quality content for which there is generally unmet demand. Most entertainment companies operate venues in large cities and are able to attract large audiences. Public investment can also influence the location of these companies — for example, cities that want to improve the arts and the cultural life of their residents may provide financial or other incentives to create or relocate a company. However, the demographics of a given audience as well as its preferences vary depending on the type of content being offered. For example, consumers at sporting events are generally male and younger compared to those who attend arts events. There are several general categories of live entertainment events, which include (i) live music; (ii) family events, theater and cultural expositions; and (iii) sporting events. Worldwide, the top 15 event promoters sold nearly 92 million tickets in 2017, according to Pollstar. Ranking Pollstar - Top promoters in number of tickets sold (millions) in 2017. The live music segment includes the promotion and production of the event. Generally, in order to promote and produce a live concert or tour, an artist will be directly represented by an agent, who in turn contacts promoters to negotiate a tour for some period. In certain cases, however, promoters will contact an agent or the artist directly. The compensation structure for artists can vary significantly. For instance, some contracts offer guaranteed base compensation, a percentage of box office revenue, a percentage of profits from the event or some combination thereof. Promoters may reimburse artists for production expenses, such as sound and lighting. In recent years, there has been a significant shift in how artists are compensated. The primary sources of revenue for the music industry are tours, recorded music sales and royalties. The North American live music industry, however, has seen tour revenue comprise an increasing portion of total entertainment spending while recorded music sales has fallen. In 2004, recorded music brought in five times the total revenue of tours, according to Pollstar. But by 2009, recorded music revenue was just under twice the total revenue from tours. Tours have become essential to artists, who face pressure to increase their number of live appearances in order to offset slumping revenues from music sales. T4F believes this trend is in part correlated to the increased availability of music on the Internet. The live music segment has been increasing in Brazil lately. In many cases, sponsors are seeking to integrate and associate their brands with the event around it. Known as a "brand experience," T4F’s live music events are a sought-after way to accomplish this. T4F operates in markets of varying sizes, and the table below lists the principal venues in South America. The theatrical category includes producing existing musicals and dramatic works, as well as developing new pieces. Musical producers typically acquire the rights to a given show for three to four years in exchange for royalties paid to the rights holders. The promoter is responsible for ticketing, staffing the event and creating the event’s publicity as well as compensating rights holders, which are reimbursed later along with the ticketing expenses. Since musicals generally require larger investments of time and money than dramatic productions, they are more likely to become tours. 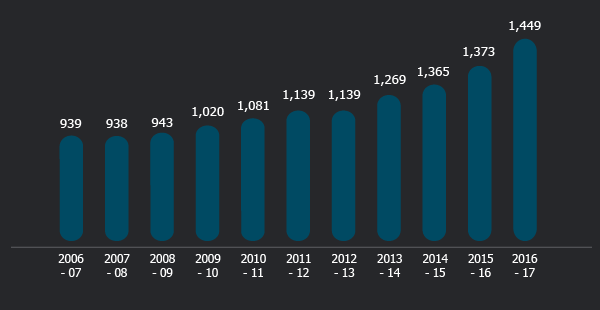 In North America, over the last thirteen years, revenue from Broadway productions has grown at an average annual rate of approximately 6.0%, as shown in the chart below. In Brazil, most musicals are international musicals are targeted to families. The popularity of this segment has gained momentum in part because these international productions have been brought to Brazil, including Wicked, Sister Act, The Lion King, Les Misérables, The Phantom of the Opera, Beauty and the Beast, Miss Saigon, Chicago, Adams Family and Mamma Mia!. Due to the expansion of this category and an increasingly demanding public, the number of venues capable of accommodating these types of shows, including existing venues that have been remodeled, has increased. These types of events typically display the work of Brazilian and international artists, who exhibit paintings, sculptures, photos, and other work. In contrast to other entertainment segments, the success of cultural events depends more on the public’s access to the event, particularly if it occurs throughout the city in areas such as parks and metro stations. This segment is also more price-sensitive and average ticket prices tend to be lower. The city of São Paulo is the main cultural center in Brazil and approximately R$700 million is spent annually to rent event space for cultural events, according to SPTuris, São Paulo’s tourism board. São Paulo has hosted some of the most important exhibits in South America over the past few years, including Painted Bodies (Corpos Pintados), Water at the Oca in Ibirapuera Park (Água na Oca), Bodies and exhibits featuring the work of Leonardo da Vinci, Auguste Rodin, Monet and Picasso. This segment generally involves promoting and producing specialized automotive events like motorcycle, truck and auto races, among others. Among sporting events, automotive events in particular have grown substantially. The sport has become more popular with fans, which has generated increased demand for events. This parallels the experience in Europe and Asia, where new racetracks have been constructed in recent years. The principal global events are Formula 1, NASCAR and the Indy Racing League. T4F believes this segment shows great potential for development in Brazil, particularly given the expansion of sports marketing. The principal sport in Brazil is soccer, but other sports like volleyball, basketball, tennis and futsal (an indoor version of soccer) have received considerable amounts of sponsorship and are starting to gain market momentum. Brazil has hosted a variety of international competitions, such as the Grand Prix of Brazil Formula 1, the São Paulo Indy 300, the global Beach Volleyball championship and international marathons, among others. Event sponsorship is one of the most important drivers of growth in this segment. The South American live entertainment market is fragmented with respect to the number of participants operating such as (i) Dell’Arte Soluções Culturais; (ii) Artplan; (iii) Dream Factory (part of the Artplan group); (iv) 360º Below the Line; and (v) Divina Comédia ; (vi) Aventura Produções. T4F believes, however, no other company in the sector has a vertically-integrated business model with the quantity of quality content offered. Regarding Family events and theater and due to the sales performance and audience success, T4F is investing much more in this segment. T4F faces competition in this area from (i) T’ai Produções e Eventos, who produced Superkite, part of the World Kitesurfing Circuit; (ii) SPIRIDON - Promoções e Eventos, which produced a stage of the Triathlon World Cup; (iii) Dunas Race, which is responsible for a rallycar race event known as Rally dos Sertões; (iv) YESCOM, which produced events such as the South American Tennis Open and the Davis Cup; (v) Koch Tavares, the company responsible for the addition of beach volleyball to the 1996 Atlanta Olympics; (vi) Maric Eventos, responsible for the São Paulo Open international tennis tournament; and (vii) Latin Sports, which produces a variety of sporting and speaking events as well as providing consultant services. In 2012, the population of South America (considering only Brasil, Argentina, Chile e Peru ) consisted of an estimated 282 million people. This market represents vast potential for the live entertainment industry, and the region’s high rates of economic growth underscore the opportunity. GDP grew an average of 13% per year, reaching US$3.3 trillion in 2012, according to IMF estimates. 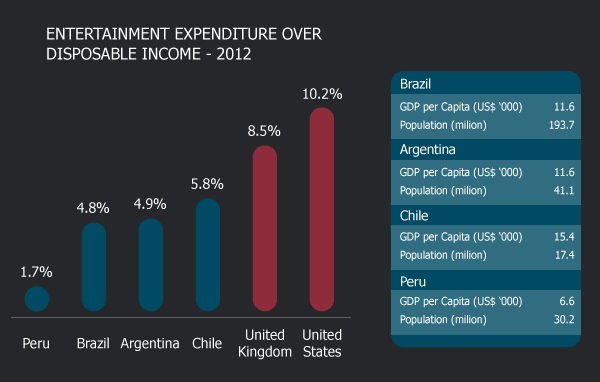 For Brazil, Argentina and Chile, which together account for nearly 80% of the region’s GDP, entertainment spending is significantly lower than in more developed economies such as the United States and the United Kingdom, as highlighted by the table below. Further, the data below suggests that as the region’s GDP per capita increases, entertainment spending will comprise an increasingly larger percentage of disposable income. There is a positive correlation between GDP per capita and entertainment spending as a percentage of disposable income, as illustrated by the chart below. 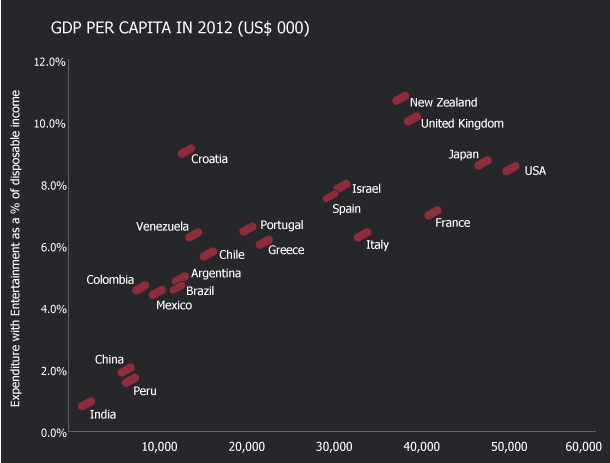 GDP per capita in developing countries has, at times, grown faster than developed countries. The South American live entertainment market is fragmented with respect to the number of participants operating in each level of the production of events, but the market is relatively consolidated in terms of quality content providers and venue operators. T4F believes, however, no other company in the sector has a vertically-integrated business model with the quantity of quality content offered. Accordingly, there are different local niche competitors at each stage of T4F’s business, including event promotion, event production, ticketing services, venue operation, and food, beverage and merchandise sales, but no competitor that operates along all levels of the value chain.